2. While first pressing and holding down the Enter button, press and hold the Power button. 3. Continue to hold both the Enter key and Power button until the diagnostic screen appears. Now that you are in the diagnostic screen, press the Mode button, exactly 7 times. The 910XT should beep each time the Mode button is pressed. If the third line called Baro Alt shows 65,000 ft or 20.00 km and the fourth line under Baro Pressure shows 0, then your unit is faulty. Power off the 910XT to exit out of diagnostics mode. 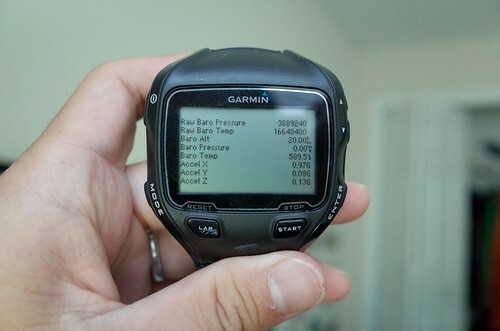 Call Garmin at 1-800-800-1020 with this information provided and they will send you a new watch. If you are out of the warranty period, as I was, they will send you a factory refurbished unit, even if the warranty period has expired. If you want to keep you existing unit until the new one arrives, Garmin will charge you $199 on your credit card as a deposit and when refund you when they received the old unit back.